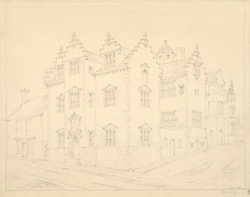 This fine pencil drawing depicts the extravagant facade of Plas Mawr house in Conwy, North Wales. Plas Mawr is a superbly preserved Elizabethan town house. The gatehouse, seen in this drawing, was the last addition to the building, completed in 1595 under the supervision of Robert Wynn, a wealthy merchant. It is one of the few houses of its kind to be left untouched over the centuries; almost all the plasterwork remains intact. The property displays fine chestnut roof-trusses, unusual spiral staircases and elaborate crow-stepped gabling.